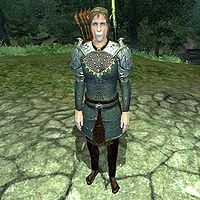 This article describes the NPCs who are Vampires. For information on the disease and how it affects the player, see Vampirism. The following tables summarizes the various types of vampires in the game. 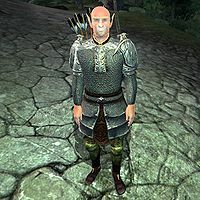 Various caves, mines, Ayleid ruins, forts and sewers are occupied by vampires (see Vampire Dungeons for details). 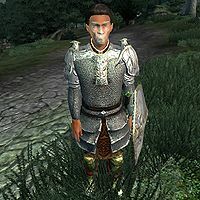 Additionally, several NPCs located around Cyrodiil's towns are vampires, often hiding undercover, for obvious reasons. The most common variety is simply identified as Vampire and a random vampire from 63 different possible varieties (three per each class) will appear. Vampires are frequently accompanied by wolves, who may actually appear in place of a vampire. Most of the time when you encounter a vampire, the game only specifies that a randomly determined vampire-type enemy will appear in that location. Such a vampire-type enemy has a 50% chance of being a Vampire, a 33% chance of being an Undead and a 17% chance of being a Vampire beast (either Rat, Wolf or Timber Wolf). Vampire Patriarchs and Vampire Matriarchs are the vampire bosses and are only found in dungeons. Eleven dungeons have a single Vampire Patriarch or Vampire Matriarch and two additional ones, Barren Cave and Nornalhorst, have two. All standard vampires produce Vampire Dust upon their death. 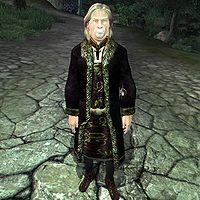 Although the Vampire Dust can be collected from the vampire's corpse, it cannot be pickpocketed from the vampire, because it does not appear until the vampire has been killed. All vampires, including Patriarchs, Matriarchs and vampire creatures, are members of the Vampire Faction. They all have the name of 'Vampire', even if they are Patriarchs or Matriarchs. 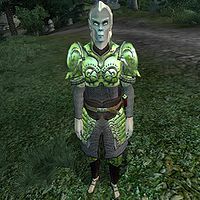 This faction ensures that they are allied with Undead, but also ensures that they are bitter enemies of any Necromancers and Liches. All vampire NPCs have 100% (stage 4) Vampirism, i.e., the same level of vampirism that you reach after not feeding for 72 or more hours. Vampire NPCs have the standard abilities, skill bonuses, and attribute bonuses for 100% Vampirism. 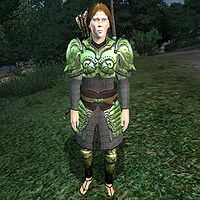 The skill bonuses and attribute bonuses are applied on top of the NPC's baseline statistics. 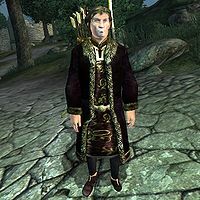 Some vampires also possess a special birthsign named "Vampire Mage" which fortifies their Magicka by 50 points. 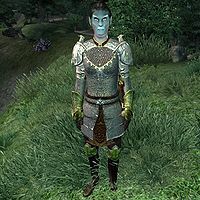 Vampire Acrobats are all Bosmer and are all acrobats by class. Of the three different varieties, two are female and one is male. They tend to be equipped in a light, sneak-oriented way. 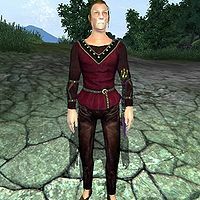 They are all clothed with a random selection of vampire clothing from all classes; for example a burgundy linen shirt and blacksmith's pants as well as some random lower-class shoes. 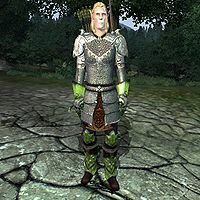 * Weapons quality and possible enchantment suffers from small changes from one variety to another. † The number of possible arrows received changes depending upon your level, as does the quality of the arrows. 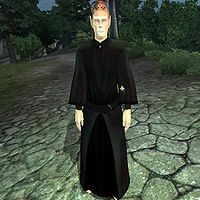 Vampire Agents are all Breton and are all agents by class. Of the three different varieties, two are female and one is male. Similarly to Acrobats, they tend to be equipped in a light, sneak-oriented way. They are all clothed with a random selection of vampire clothing from all classes; for example a grey robe and laced leather pants as well as some random lower-class shoes. 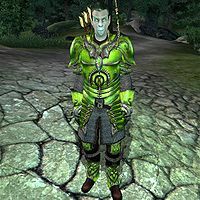 Vampire Archers are all Bosmer and are all archers by class. Of the three different varieties, two are male and one is female. Similarly to Acrobats and Agents, they tend to be equipped in a light, sneak-oriented way. They are all clothed with a random selection of vampire clothing from all classes; for example a black robe and burgundy linens as well as some random lower-class shoes. 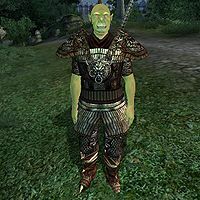 Vampire Assassins are all Dunmer and are all assassins by class. Of the three different varieties, two are male and one is female. Similarly to Acrobats and Agents, they tend to be equipped in a light, sneak-oriented way. They are all clothed with a random selection of vampire clothing from all classes; for example a dark shirt and red velvet garment as well as some random lower-class shoes. The Patriarch and Matriarch will wear upper-class shoes rather than lower-class ones. 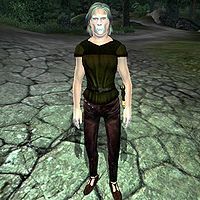 The vampire found in Bloodcrust Cavern is clothed in full lower-class garment. Vicente Valtieri is also a Vampire Assassin. 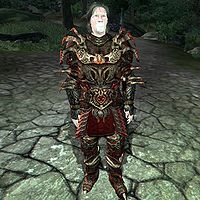 Vampire Barbarians are all Nord and are all barbarians by class. Of the three different varieties, two are male and one is female. 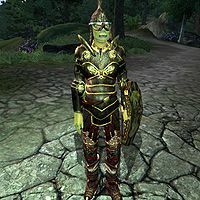 They tend to be equipped with light armor and large, heavy weapons. They are all clothed with a random selection of vampire clothing from all classes; for example a red velvet outfit and coarse linens as well as some random lower-class shoes. 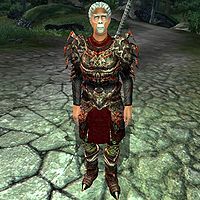 Vampire Bards are all Nord and are all bards by class. Of the three different varieties, two are female and one is male. They tend to be equipped with light armor and blades. They are all clothed with a random selection of vampire clothing from all classes; for example a black & burgundy outfit and blacksmith's pants as well as some random lower-class shoes. Nille Elf-Daughter is also a Vampire Bard. 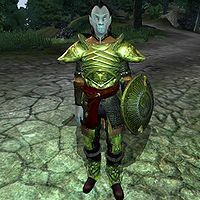 Vampire Battlemages are all Dunmer and are all battlemages by class. Of the three different varieties, two are male and one is female. 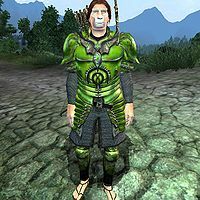 They tend to be equipped with light armor and weapons. They are all clothed with a random selection of vampire clothing from all classes; for example a highwayman's shirt and blacksmith's pants as well as some random lower-class shoes. The vampire found in Bloodcrust Cavern is clothed in full lower-class garment. Vampire Crusaders are all Orcs and are all crusaders by class. Of the three different varieties, two are male and one is female. 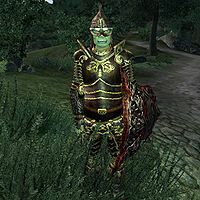 They tend to be equipped with heavy armor and blunt weapons. They are all clothed with a random selection of vampire clothing from all classes; for example a dark shirt and red velvet garment as well as some random lower-class shoes. The Patriarch and Matriarch will wear upper-class shoes rather than lower-class ones. Umar gra-Khar is also a Vampire Crusader. 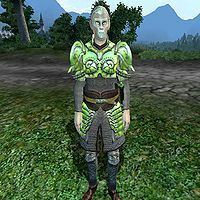 Vampire Healers are all Imperials and are all healers by class. Of the three different varieties, two are female and one is male. They tend to be unarmored and fight with light weapons. They are all clothed with a random selection of vampire clothing from all classes; for example a burgundy linen shirt and coarse linens as well as some random lower-class shoes. Although they are named Healers in the CS, this Vampire class will be called Sorcerer in-game. 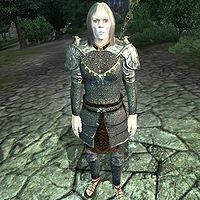 Vampire Knights are all Nords and are all knights by class. Of the three different varieties, two are male and one is female. 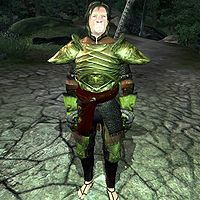 They tend to be equipped with heavy armor and light weapons. They are all clothed with a random selection of vampire clothing from all classes; for example a black robe and red velvet garment as well as some random lower-class shoes. 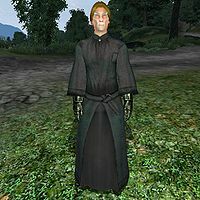 Vampire Mages are all Bretons and are all mages by class. Of the three different varieties, two are male and one is female. They tend to be unarmored and fight with daggers. They are all clothed with a random selection of vampire clothing from all classes; for example a red velvet outfit and burgundy linens as well as some random middle-class shoes. The third variety of vampire will not have any shoes. The two Bloodcrust Vampires will both wear a lower-class robe. 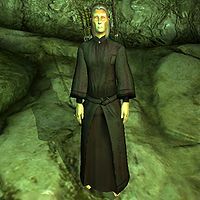 Vampire Monks are all Imperials and are all monks by class. Of the three different varieties, two are female and one is male. They tend to be equipped with a mix of light and heavy armor. They are all clothed with a random selection of vampire clothing from all classes; for example a dark shirt and laced leather pants as well as some random lower-class shoes. Avita Cassiana is also a Vampire Monk. 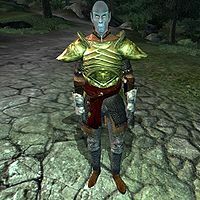 Vampire Nightblades are all Dunmer and are all nightblades by class. Of the three different varieties, two are female and one is male. 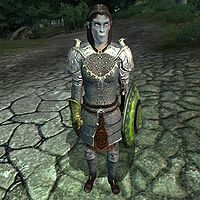 Similarly to Battlemages, they tend to be equipped with light armor and weapons. They are all clothed with a random selection of vampire clothing from all classes; for example a grey robe and burgundy linens as well as some random middle-class shoes. The first variety wears lower-class shoes. Seridur and Dark Minion are Vampire Nightblades. 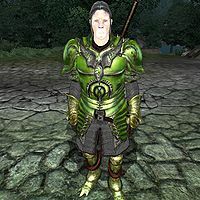 Vampire Pilgrims are all Dunmer and are all pilgrims by class. Of the three different varieties, two are female and one is male. They tend to be equipped with light armor and blunt weapons. They are all clothed with a random selection of vampire clothing from all classes; for example a red velvet outfit and burgundy linens as well as some random lower-class shoes. The Pale Lady is also a Vampire Pilgrim. 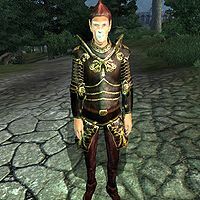 Vampire Rogues are all Redguard and are all rogues by class. Of the three different varieties, two are male and one is female. They tend to be equipped with light armor and blades. 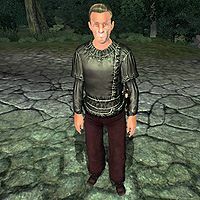 They are all clothed with a random selection of vampire clothing from all classes; for example a burgundy linen shirt and blacksmith's pants as well as some random lower-class shoes. The vampire found in Bloodcrust Cavern is clothed in full lower-class garment. 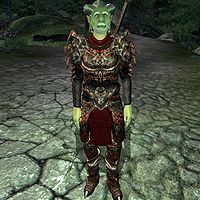 Vampire Scouts are all Redguard and are all scouts by class. Of the three different varieties, two are male and one is female. 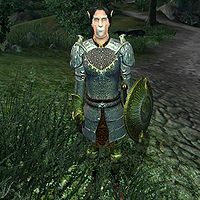 They tend to be equipped with heavy armor and blades. They are all clothed with a random selection of vampire clothing from all classes; for example a dark shirt and red velvet garment as well as some random lower-class shoes. 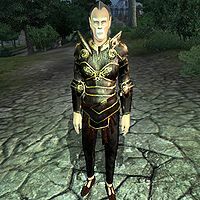 Vampire Sorcerers are all Altmer and are all sorcerers by class. Of the three different varieties, two are male and one is female. 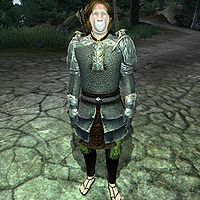 They tend to be equipped with a mix of heavy armor and clothing and are armed with daggers. 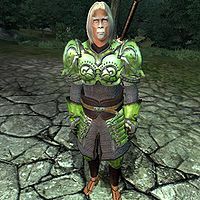 Because of various birthsigns, they will have enormous quantities of Magicka at higher levels. They are all clothed with a random selection of vampire clothing from all classes; for example a highwayman's shirt and coarse linens as well as some random middle-class shoes. The Patriarch and Matriarch will also wear middle-class shoes. 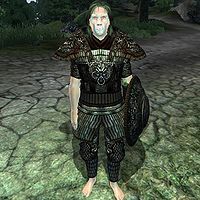 The vampire found in Bloodcrust Cavern will wear a lower robe and no shoes. 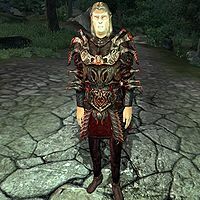 Vampire Spellswords are all Breton and are all spellswords by class. Of the three different varieties, two are male and one is female. 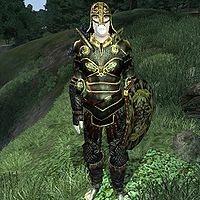 They tend to be equipped with heavy armor and weapons. They are all clothed with a random selection of vampire clothing from all classes; for example a burgundy linen shirt and red velvet garment but wear no shoes. Of the two vampires found in Bloodcrust Cavern, one is clothed in full lower-class garment and one in with a lower robe but no shoes. 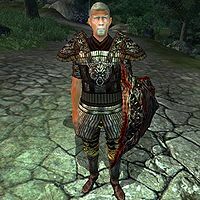 Jakben, Earl of Imbel is a Vampire Spellsword. 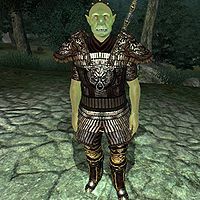 Vampire Thieves are all Bosmer and are all thieves by class. Of the three different varieties, two are female and one is male. Similarly to Agents and Assassins, they tend to be equipped in a light, sneak-oriented way. 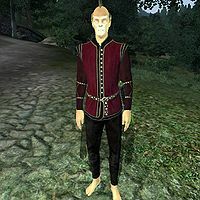 They are all clothed with a random selection of vampire clothing from all classes; for example a burgundy linen shirt and blacksmith's pants as well as some random lower-class shoes. 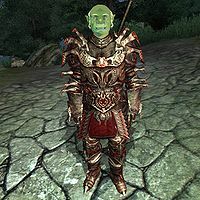 Vampire Warriors are all Orcs and are all warriors by class. Of the three different varieties, two are male and one is female. 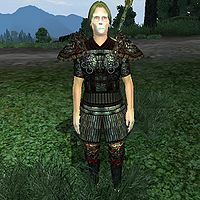 They tend to be equipped with heavy armor and light weapons. They are all clothed with a random selection of vampire clothing from all classes; for example a dark shirt and laced leather pants as well as some random lower-class shoes. The two vampires found in Bloodcrust Cavern are both clothed in full lower-class garment. Ghola gro-Muzgol and Hindaril are also a Vampire Warriors. 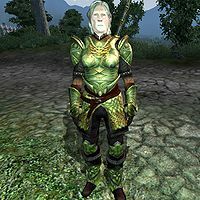 Vampire Witchhunters are all Altmer and are all witchhunters by class. Of the three different varieties, two are female and one is male. They tend to be unarmored and fight with light weapons. They are all clothed with a random selection of vampire clothing from all classes; for example a burgundy linen shirt and coarse linens although they do not wear any shoes. Aranalda is also a Vampire Witchhunter. Lord Lovidicus, who is actually the father of Agronak gro-Malog, the Arena Grand champion. He is found in Crowhaven. 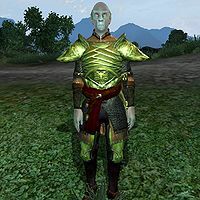 Janus Hassildor, the elusive Count of Skingrad. 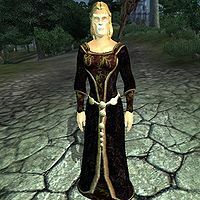 Rona Hassildor, Janus' wife and the former countess of Skingrad. The Order of the Virtuous Blood: You are asked to help kill a Vampire. 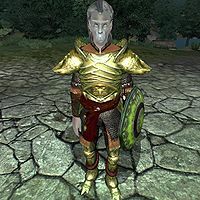 Origin of the Gray Prince: Agronak gro-Malog, the Imperial Arena Grand Champion asks you to find proof of his noble birthright. Vampire Cure: A long quest to gain the cure for vampirism. Darkness Eternal: Accept Vicente Valtieri's offer to become a vampire. Boots of Springheel Jak: Find out where Springheel Jak is buried and retrieve a pair of magical boots for the Gray Fox. 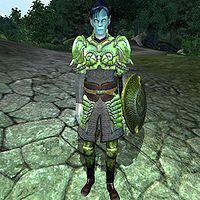 Azura: Kill some former worshippers of Azura who have been turned into vampires. Lost Histories: Finish a job from which a guildmate has not returned. NPC vampires in the game are generally unaware of your vampiric state and unlike other NPCs, will not comment on your condition. Although NPC vampires possess the vampire feeding animation, they will never attempt to feed during standard gameplay. It is also not possible for you to feed upon a sleeping vampire NPC: attempting to do so will cause the vampire to wake up and start a conversation with you. 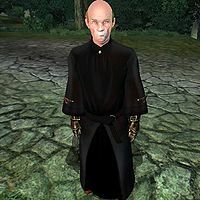 Although vampire NPCs have an active 8 pts per second Sun Damage effect, the damage done to NPCs is far less than the damage done to you. The effect shader is activated, so their skin appears to burn. However the damage is not ongoing, so exposure to the sun would only kill a vampire NPC with extremely low health. Esta página foi modificada pela última vez à(s) 06h49min de 21 de novembro de 2014.